A fascinating book Fr. 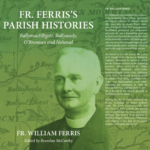 Ferris’s Parish Histories:BallymacElligott, Ballyseedy, O’Brennan and Nohoval will be launched next Thursday 7th June in Ballygarry House Hotel, Tralee, by Bishop of Kerry Ray Browne. This book edited by Brendan McCarthy after five year’s work on the original manuscript, will be of immense interest not alone to natives of the parishes mentioned but to all who have in interest in life in Kerry. The book can be purchased (€15) in all good Kerry bookshops or order online from publishers. With its substantial Protestant population, the book comprises for both the Catholic and Protestant community in this part of the county a substantial genealogical archive. Fr. William Ferris spent much of his five-year curacy from 1929 to 1934 in the parish of BallymacElligott, Co. Kerry, systematically collecting from his parishioners a vast archive of popular history covering not just the parish of BallymacElligott but also the neighbouring parishes of Ballyseedy, O’Brennan, and Nohoval. When almost ready for publication, the book was banned by the Bishop of Kerry because Fr. Ferris had ‘gone against the traditions of the diocese’ as regards his chapter on St. Brendan and the patron saint of Kerry’s place of birth. Dismayed at the ban, Fr. Ferris shelved the manuscript and it has lain dormant ever since. Now after eighty-five years, Fr. 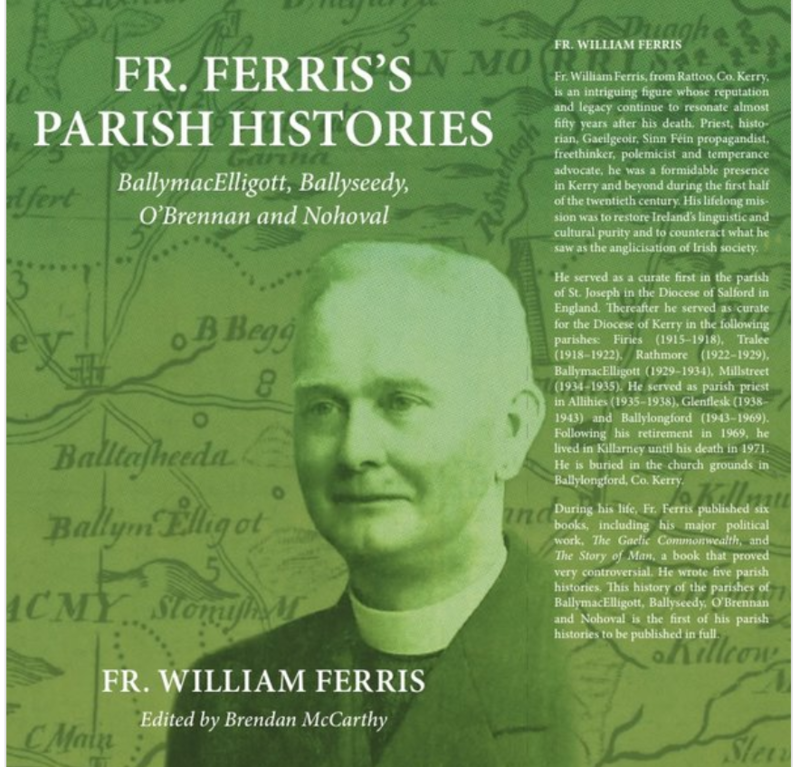 Ferris’s History of the Parishes of BallymacElligott, Ballyseedy O’Brennan and Nohoval is finally published. The book documents not just the history (political, economic and social) of the area and the cultural and topographical landscape, but also comprises a rich genealogical resource. It is a unique compendium of North Kerry life at a time of rapid change and an important record of the oral history and culture of rural life in early twentieth century Ireland. The uniqueness of the book lies not only in the fact that the content will be new material to the reading public but also thanks to Fr. Ferris recording it in the early 1930s, the fund of oral history, reminiscences, folk memory place names, archaeological heritage, etc of a passing generation was not taken to the grave but was in fact, preserved and is now finally available to the public. Hello, the link for the surname index in Fr. Ferris’s Parish Histories is not working. Kathleen, that link should work now. You scroll down to the end of the page for thlist. Thank you for tipping me off. Anything similar for Ballylongford? Or is there any reference to Ballylongford in the book? Sounds fascinating. Mary, I don’t know of anything similar for Ballylongford, even though Fr. Ferris spent a number of years there also. The surname list states not attainable at the end of your notification. Sheila, thank link should be working now. You scoll down to the end of the page to see the list. Thank you for letting me know. My Grand Uncle Fr’ Michael O’Donoghue was PP of Ballymac, he was also a great historian. Hi Kay, I am not able to get the Index link to work either. Rozanne, sorry if you can’t get the link to work – I have no idea why but the website is https://ballymacelligott.com and go right down to the end of the page. A welcome development that the book that was banned by the Bishop of Kerry because Fr. Ferris had ‘gone against the traditions of the diocese’ as regards his chapter on St. Brendan and the patron saint of Kerry’s place of birth. Fitting it should be launched by the current bishop of Kerry. It would be interesting if the St Brendan / Sicily connection could be explored. As a navigator/missionary, St Brendan may also have had interests in North Africa.